In a recent article by Yahoo! Sports columnist Jason Cole, he ranks all 32 running back units in the NFL. Cole has the Minnesota Vikings atop of the list. The rest of his top five includes the Tennessee Titans [second], Carolina Panthers [third], Baltimore Ravens [fourth] and Cincinnati Bengals [fifth]. As for the Philadelphia Eagles running back situation, they rank 31st. Only the Cleveland Browns finished below the Eagles on Cole's list. One of the reasons that Cole has the Eagles ranked so low is because of his evaluation ofsecond-year running back LeSean McCoy. Cole believes that McCoy does possess a lot of talent, but he does not think he will be the all-around receiving and running threat that the Eagles envision him becoming. 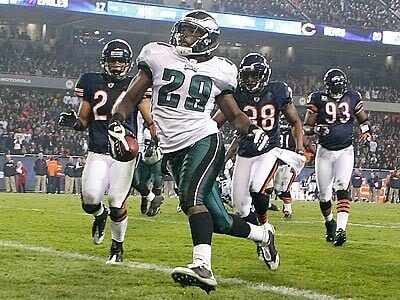 Furthermore, he disagreed with the move to get rid of veteran RB Brian Westbrook. Moreover, he does not see fullback Leonard Weaver as a adequate backup running back to McCoy. "After cutting Westbrook, the Eagles are clearly banking on LeSean McCoy becoming the all-around running and receiving threat to trigger the offense," Cole wrote. "Based on how McCoy played last season, that may be a bit of a stretch. McCoy looked tentative as a runner and out of place as a receiver. He’s a talented guy, so there’s still a chance, but the first impression was questionable. Bullish Leonard Weaver is around to pick up some change-of-pace yards, but he’s not a true backup." Apparently Cole missed the memo or has not been paying attention to the Eagles off-season additions as they signed former Saint RB Mike Bell to a one-year contract. Bell is a competent young backup running back that has starter's experience. So him stating that Weaver is the team's backup is not entirely accurate. Additionally, Weaver had a great first season with the Eagles. Weaver made the Pro Bowl and was the best fullback in the league. While the Eagles do not deserve to be in the top 5 or top 10, they definitely should be ranked ahead of team's like Tampa Bay, Oakland, Kansas City and Seattle. Still, this probably does not bother Andy Reid that much since he likes to throw the ball more anyway. Now he has a legit reason to do so. With Donovan McNabb out of the picture and in a Redskins uniform, quarterback Kevin Kolb gets the keys to the high octane and pass-heavy offense. According to NFL.com's Pat Kirwan, Kolb makes his list of top 20 players poised for a breakout season in 2010. In fact, Kolb ranked 13th on his list of potential breakout players and only one of two quarterbacks to make the cut [Dolphins QB Chad Henne is the other at No. 10]. Kirwan believes that the Eagles sent a strong message to the rest of the league and even their fan bases by trading their franchise quarterback McNabb to their division rival. He also thinks this confidence is a reason that Kolb could be on his way to having a very impressive season. "It says a lot when a team trades a franchise quarterback to a division rival and hands the offense to someone who wasn't a first-round pick and has just two career starts," Kirwan wrote. "Coach Andy Reid likes to throw the ball, so look for Kolb to be up around 500 pass attempts. Both of his starts resulted in 300-yard passing games. While he won't keep up that pace, the numbers could add up with that many attempts." For Eagles fans, they hope Kolb can come in and lead the Eagles to success right away. Especially since they traded away a potential future Hall of Famer in McNabb to a hated rival. Furthermore, the Eagles franchise has not won a title in 50 years and if Kolb cannot adequately replace McNabb sooner rather than later, the fan base might become more restless than they are now. One of the biggest obstacles for new starting QB Kevin Kolb is not just having success on the field, but replacing one of the best quarterbacks in Eagles franchise history in Donovan McNabb. On NFL.com, senior columnist Vic Carucci analyzes Kolb taking over for McNabb, his development as a quarterback and that only time will tell if Kolb gets out of the large shadow that McNabb has created.